In other words, if you use the service, any dispute regarding the service itself (e.g. the protections fail to work) would be forced into arbitration — but legal action relating specifically to the breach is not affected. I’ve contacted Equifax for more specifics, but their press office is likely being bombarded right now so it may be a while before they respond. Timely written notice of opt out must be delivered to Equifax Consumer Services LLC, Attn. : Arbitration Opt-Out, P.O. Box 105496, Atlanta, GA 30348, and must include Your name, address, and Equifax User ID, as well as a clear statement that You do not wish to resolve disputes with Equifax through arbitration. Note: I am not a lawyer or financial advisor. 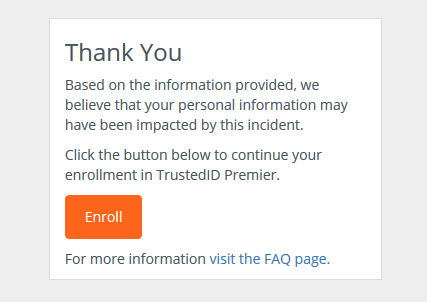 Equifax may change these terms or interpret them differently (which is why I asked for more information). If you are at all unsure about this, wait and see and take actions of your own, such as notifying your bank, getting a free credit report and watching for suspicious transactions. By consenting to submit Your Claims to arbitration, You will be forfeiting Your right to bring or participate in any class action (whether as a named plaintiff or a class member) or to share in any class action awards, including class claims where a class has not yet been certified, even if the facts and circumstances upon which the Claims are based already occurred or existed. Such forced arbitration clauses are common in service agreements, and have been held up repeatedly in court. Instead of using the court system, consumers would have to take complaints or damages through an arbitration system under terms dictated by the company. Arbitration agreements may limit consumers’ ability to appeal, under what jurisdiction negotiations would take place, whether the process is public or secret, and so on. It’s possible that the process may be faster and simpler in some cases, but one cedes an immense amount of control to the company — which it is certain to exert for its own benefit. There was no indication in the terms of service that this particular clause would apply only to certain disputes, and people naturally perceived it as an opportunistic attempt by the company to inoculate itself against legal action.